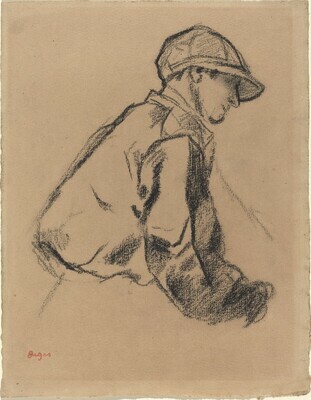 Atelier Degas, Paris, until 1917 (Lugt 657); (3rd atelier sale, Galerie Georges Petit, Paris, 1918, no. 105.4). (Galerie Schmidt, Paris, by 1975). (E. V. Thaw and Co., Inc., New York); Mr. and Mrs. Paul Mellon, Upperville, VA, 1978; gift to NGA, 1999. Degas, Galerie Schmit, Paris, 1975, no. 80. Degas, Virginia Museum of Fine Arts, Richmond, 1978, no. 24 (no cat.). Degas at the Races, National Gallery of Art, Washington, 1998, no. 76. Degas at the Races. Exh. cat. National Gallery of Art, Washington, 1998: no. 76.